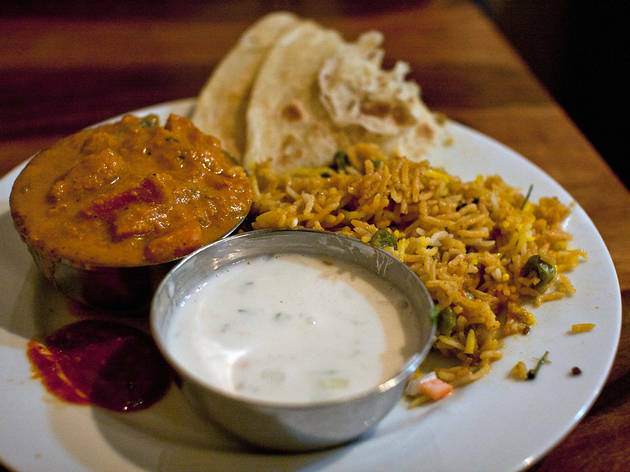 For Tokyo's Indian curry lovers, Nirvanam is indispensable. Imagine, if you dare, a curry house that doesn't open proceedings with the words, 'karasa wa?' ('what spice level would you like?') and, instead, serves up south Indian cuisine as south Indians like it: spiced according to taste, rather than as a kind of dare. The best way to experience this little idyl is over a long lunch. Get there early, as it gets crowded (secrets this good don't stay secret for long), and – if you can – try to arrive with an empty stomach. For a mere ¥1,200, you get one of the best lunch buffets the capital has to offer – all the Keralite, Tamil and Hyderbadi grub you can possibly cram in. 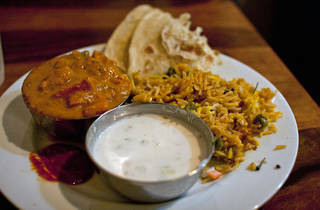 While mutton and chicken curries are available, it's the vegetarians who will enjoy this spot the most. Specialties include Tamil sambar, vada lentil donuts, Hyderbadi vegetable curry and baskets of Keralite parota to mop it up with (you know you're in the hands of the pros when parota is favoured over naan). What's more, there's not a bad dish among them. You'd happily pay the buffet price for one or two of these dishes; everything offered up at these prices in an unlimited serving might leave you feeling spoilt. Our advice? Enjoy it, but make sure you've got an empty afternoon to sleep it off with afterwards. You're not going to leave feeling light.